Your "Unfair Advantage": Blue Star Status is your simple solution to rapidly increase your natural testosterone production 434% higher than you would by just lifting weights. * Delivering results truly worthy of today's modern man. 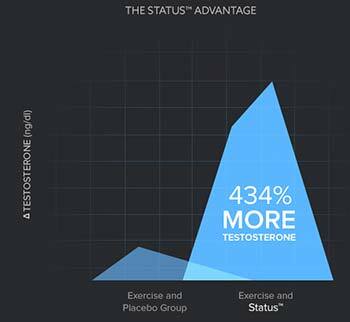 What makes Blue Star Status truly unique is its revolutionary five-pronged approach to testosterone-boosting. No other testosterone supplement in existence does so much, so quickly. Here’s how you’ll boost your testosterone 434% higher than you would by just lifting weights. Micronutrient Support: Blue Star Status contains Zinc, Magnesium, and Vitamin B6 at the clinically researched doses shown to boost natural testosterone levels. 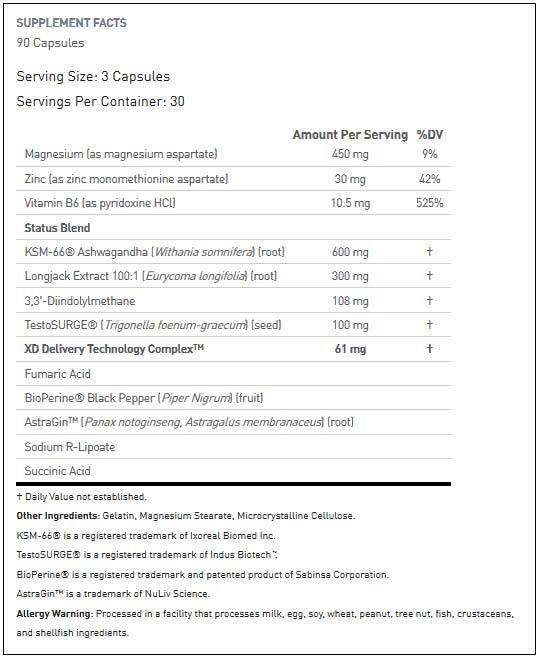 Specifically, 30 mg of Zinc when combined with 450 mg of Magnesium, supports testosterone production through the increase of luteinizing hormone (LH) at the pituitary gland. The addition of Vitamin B6 increases the bioavailability of Zinc and Magnesium to help increase free testosterone Levels. Weightlifters, Rejoice: Blue Star Status contains ample amounts of KSM-66, a natural herb extract that reduces the stress on your hormone producing glands allowing for higher testosterone product. Stop The Loss: Naturally produced testosterone has only a short period of effectiveness before it rapidly loses its ability to build muscle and burn fat. That's exactly why Blue Star Status contains Testosurge. It prolonhs this otherwise short, but extremely valuable period during which your body reaps the benefits. In addition to naturally accumulate testosterone at levels higher than your resting average. Block Out Estrogen: 3,3'-Diindolylmethane (DIM) has been shown to reduce total estrogen content as well as block existing estrogen from producing its associated feminine effects. Lucky for you, DIM is in Blue Star Status. What's In Blue Star Status? How Do I Take Blue Star Status? Dosage: Take 3 capsules of Blue Star Status in the morning with or without food. KEEP OUT OF REACH OF CHILDREN. Not intended for use by persons under 18. Consult a health care provider before use if you have been treated for or diagnosed with, or have a family history of any medical conditions, or if you are using any prescription or over-the-counter medications. Consult a health care provider before starting any diet or exercise program. Do not exceed recommended serving. Improper use of this product will not improve results and is not advised. Use only as directed. Do not use if safety seal on this package has been broken. Store in a cool, dry place (60 to 80 degrees F). We have a large selection of in-stock Blue Star Nutraceuticals products including Blue Star Nutraceuticals items and others for the lowest prices at SameDaySupplements.com® It's always easy to shop for Status 90 Caps, Testosterone Support, By Blue Star Nutraceuticals at SameDaySupplements.com because you can browse by reviews, brand, prices or search for specific ingredients using our search tool. In-stock orders placed before 3pm EST ship out the same day to USA, Brazil, United Kingdom, Canada, Germany, Australia, Japan, India, France and worldwide at the cheapest prices online.